As the Official Registrar of ABA Routing Numbers, we provide you with the most up-to-date information to find and validate U.S. routing numbers. Whether you want to access this information through an online database or integrate this data automatically into your payments systems, we can provide you with a flexible tool that meets your needs. 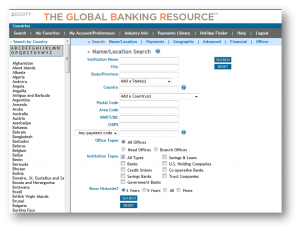 Our Global Banking Resource, an online look-up tool, is the most similar to the ABA free routing number service you just experienced. We invite you to request a demo, or connect with us to determine if a different solution best meets your needs. Would you like more information about Accuity's payments products?